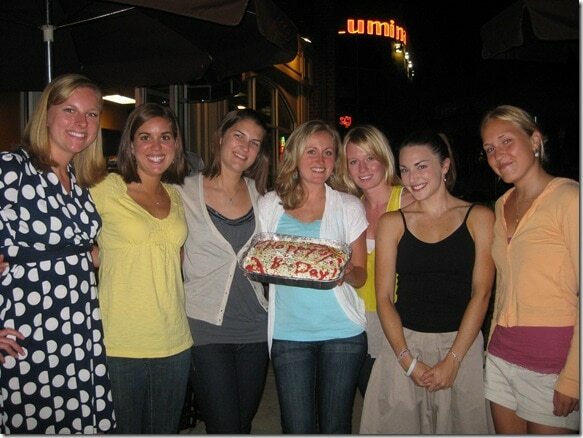 Matt is in DC all week for work as usual, so some of my fellow grad students took me out for pizza and wine! My sweet friend Lauren even baked me a birthday cake :) Yay! And now for the food science lab recap I promised you! 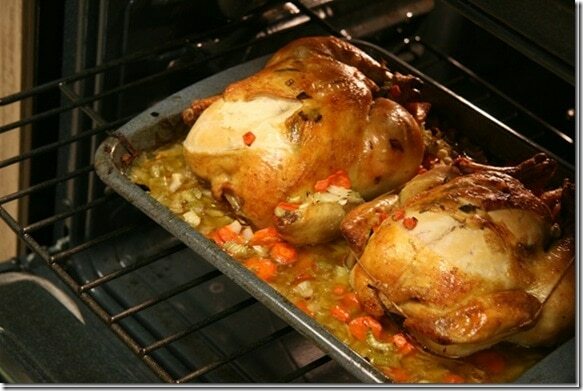 On Monday night, we learned how to clean, stuff, and roast a whole chicken! To prepare the chicken for roasting, we cleaned out the innards, rubbed the raw chicken (inside and out) with salt and pepper, and then stuffed it with chopped onion, carrots, celery, lemon, rosemary, and thyme. The remaining veggies went under the chickens! Whew! My hands were SO GROSS afterward! 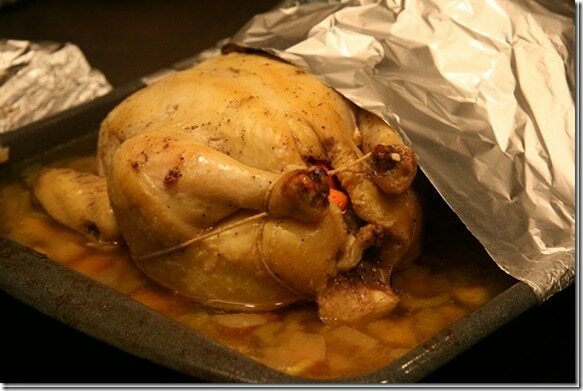 After trussing the chicken, we put the it in the oven until it reached 165 degrees — which is the temperature that kills Salmonella! It took a couple hours to get there. 1. Essentially steaming the chicken by putting water in the bottom of the pan with the veggies and covering the chicken with tin foil. This was the chicken my group made! The chicken was a little bland, but very juicy. 2. 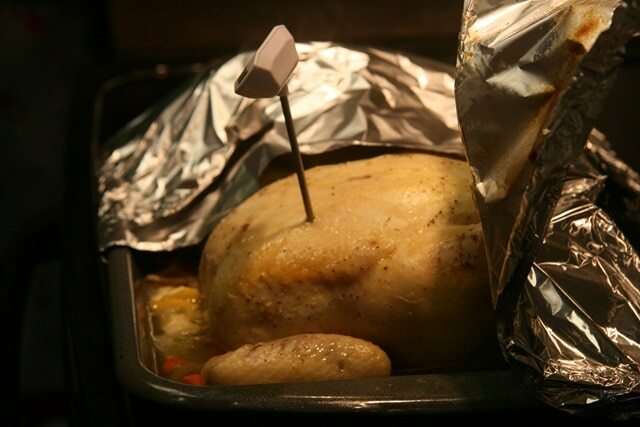 Truly roasting the chicken by omitting the water and tin foil. This created a nice golden crust! …Except that there was seafood, too! Stay tuned for the recipe for the delicious (and super easy) baked tilapia my group also made! Previous article: Happy Birthday to meeeee! 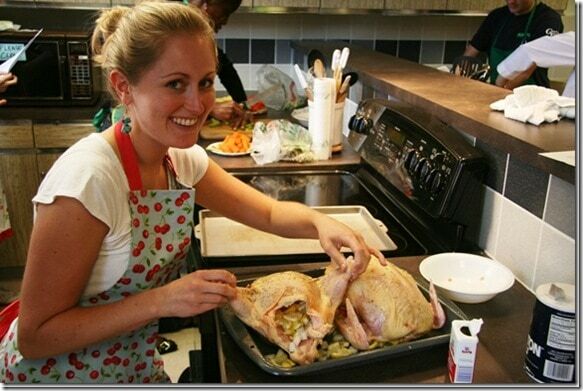 I have never roasted a chicked, though I have always wanted to try! I love roasting chickens, but I usually cheat and do it on my ronco showtime rotisserie. Got it two years ago at a white elephant gift exchange- and I use it at least once a week! Amazing! random side note- I really really love the wash on your jeans in that first pic. where did you find them! What is a ronco showtime rotisserie?! Love the post. 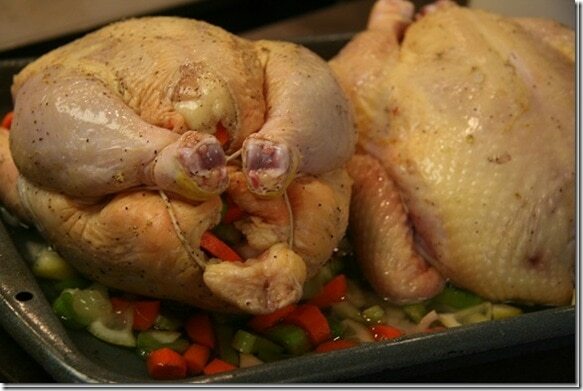 I always roasted chicken the 2nd way without water. With water looks good too. Never too late to learn, I will try it with water the next time. Happy homework. I’ve roasted a turkey once and it came out great, but I’m not a fan of the whole touching raw meat thing. And that’s a lot of meat. roasted chicken is soooo good. I am not sure I could have handled that though. I hate touching raw chicken haha. This may sound weird because you’re basically standing over raw chicken, but you look so pretty in that second picture! I’m fine with raw meat, but don’t do so well with bones … even when I chow down on fried chicken, I tend not to go all the way to the bone. 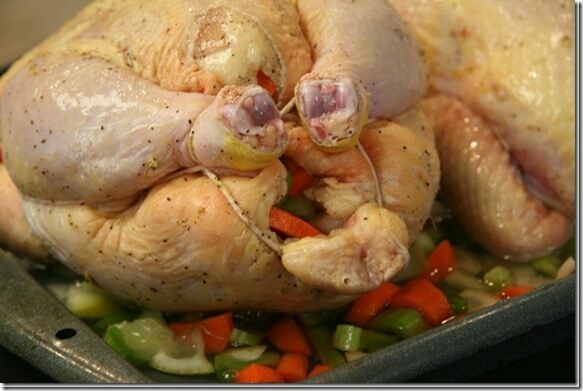 Not sure how I would do with a full chicken … though I need to learn. I love roasted chicken. i have to say the first time i ever roasted a chicken i felt like i’d reached a whole new caliber of cooking! it looks so nice but it’s so simple…and i love making stock afterwards too! Glad you had a great birthday Anne! I like your “lab” It’s wayyyy more fun than orgo ;) Do you get to eat what you guys make? Yep – we had quite the feast! The roasted won out :) Better flavor and prettier, too! And also moist. omg that looks and sounds SO GOOD!! I LOVE Roast Chickens!! I wish I read this an hour ago; I just threw a chicken into the oven! I’ve never roasted one before. Stuffing it with onion sounds so flavorful in hindsight. I need to roast a chicken! Its on my culinary to-do list! Was it difficult changing the 27 to 28 on your profile? 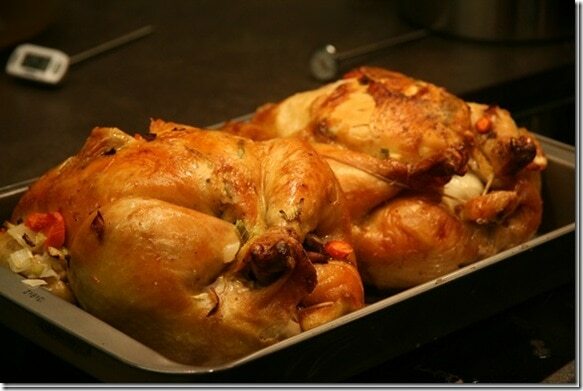 I love roasted whole chicken! I did it for the first time last Thanksgiving. It came out so juicy and the leftovers tasted awesome in a sandwich! I have just discovered your website! How excited I was to find you when looking for a recipe for a healthy turkey soup to make for a family gathering this November. I am going to roast the turkey in this fashion as you do the chicken and shred the meat instead of using the ground turkey. Have you ever roasted the bird breast side down? I did a few weeks ago by mistake and the breast meat was the BEST I have ever had!! I think I will do the same with the turkey. Thanks for all your healthy recipes. I am anxious to try them. The pumpkin pie smoothie sounds amazing. Interesting tip – I’ll have to try that! Thanks!